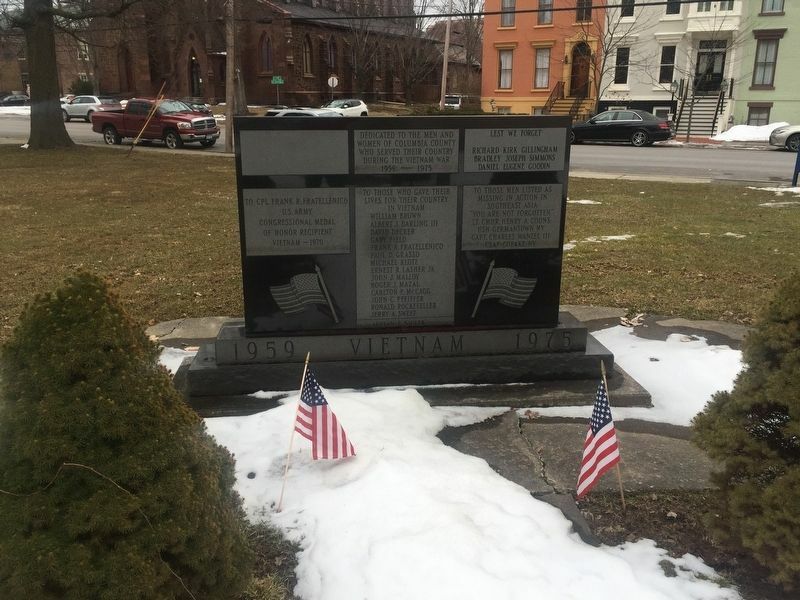 Dedicated to the men and women of Columbia County who served their country during the Vietnam War 1959-1975. Location. 42° 15′ N, 73° 47.406′ W. Marker is in Hudson, New York, in Columbia County. Marker can be reached from the intersection of Union Street and South Fourth Street. Touch for map. Marker is in front of Columbia County Courthouse. Marker is in this post office area: Hudson NY 12534, United States of America. Touch for directions. Other nearby markers. At least 8 other markers are within walking distance of this marker. WWII Memorial (a few steps from this marker); Operation Desert Storm (a few steps from this marker); Korea (within shouting distance of this marker); Davis Hall (about 600 feet away, measured in a direct line); The Kiwanis Bicentennial Inspiration Fountain (approx. 0.4 miles away); Veterans Memorial (approx. 0.4 miles away); Warren Inn (approx. half a mile away); Hudson, New York (approx. 0.6 miles away). Touch for a list and map of all markers in Hudson. More. Search the internet for Vietnam. Credits. This page was last revised on March 7, 2019. This page originally submitted on March 5, 2019, by Steve Stoessel of Niskayuna, New York. This page has been viewed 27 times since then. Photo 1. submitted on March 5, 2019, by Steve Stoessel of Niskayuna, New York. • Bill Pfingsten was the editor who published this page.